The Control Panel sports a few icons to help you get onto a network on your laptop. This includes wired and wireless connections, the Internet, dialup, and other networking options. Windows Vista uses the Network and Sharing Center icon. Windows XP has the Network Connections icon. Network Sharing Center: This is the main networking icon for Windows Vista. The below figure shows this handy window. You can also get to this window by clicking the Network Center link or button in any other window. 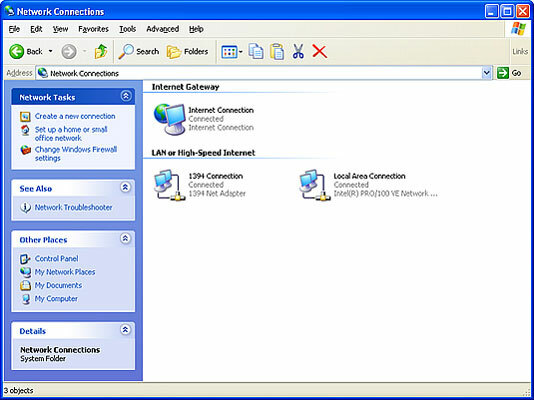 Network Connections: In Windows XP, this Control Panel icon displays a list of networking items in the computer, including wired and wireless connections, the Internet, dialup, and other networking options. For both Windows Vista and Windows XP, you can quickly get to the networking hardware center by double-clicking the wee li’l Networking Guys icon on the system tray or notification area. The icon looks like two computer monitors, one overlapping another.